Once upon a time my husband bought me a Ralph Lauren sweater for Christmas. 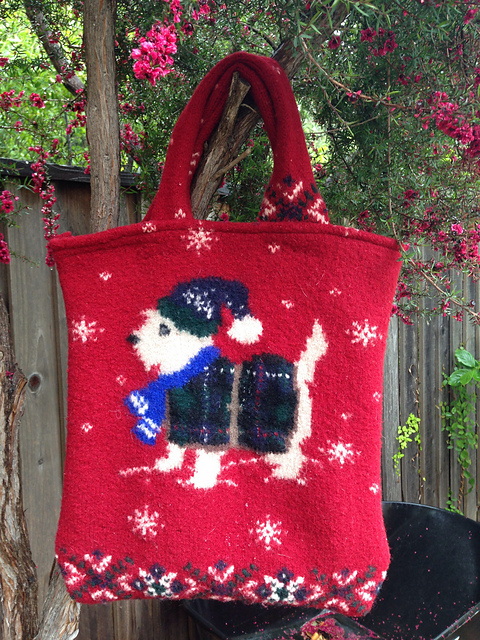 It was hand knitted in heavy wool, nice and warm, and the Westie on the front is super cute. We had Macie the Westie at the time, so we collected many Westie things. The sweater was very large, and thankfully I never grew into it, but I never wanted to part with it. A few years later I decided to give felting a try, maybe it'd shrink the sweater a bit to make it fit better. It shrank, a lot. I turned it into a pillow case and it became part of our Christmas decoration for the next few years. Then it found a place in our guest room sofabed, huddled together with a bunch of other pillows. In the past couple of weeks Henry moved into the guest bed and I had to find a place for all the pillows. Macie Sweater was to become the Macie Bag. My friend Bethany helped me measure and cut out the shapes, hemmed the edges, and sewed up the sides and bottom. There was minimal waste on the front and back. The sleeves became tube handles. 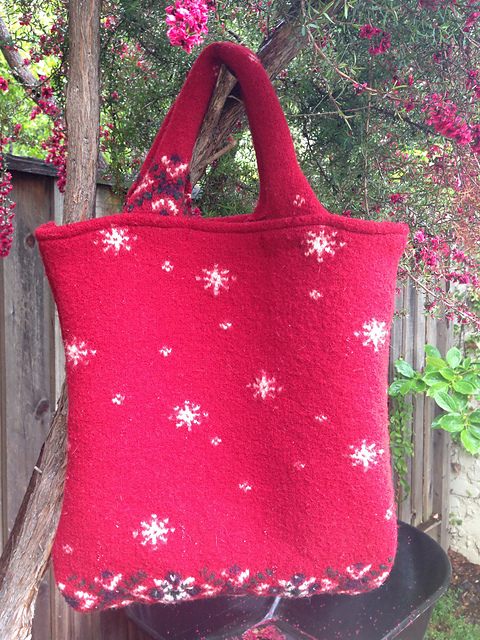 The only hand sewing I had to do was a few super thick places because of the hems and the fairisle knitting, plus sewing the handles onto the bag. The Macie Bag is perfect! That is so fabulous. I shark a sweater recently (unfortunately my favourite), not unwearable but the sleeves are too short and too tight, and have been planning to make it into a knitting bag. I feel quite inspired now. thanks for sharing. I have two sweaters I knit that I never wear and keep thinking to felt them into pillows. I don't think they would felt thick enough to be a bag, durn it! Cute, cute! Way too cute! Thanks for sharing. Love it, what a great way to reuse a cute sweater. I love this so much that I can't actually think of anything else relevant to say other than . . . I love this so much. 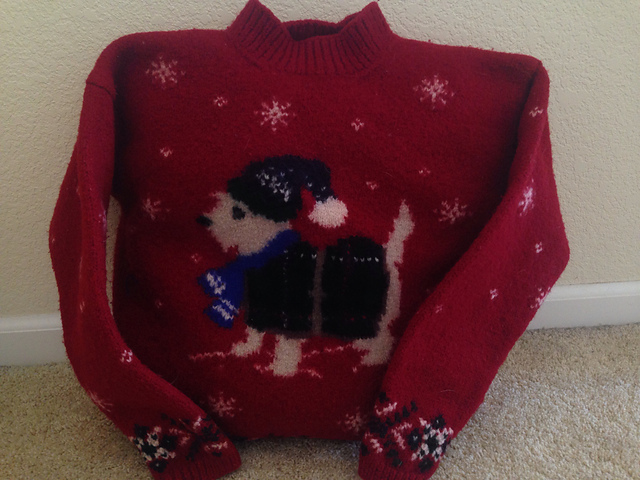 ooooh, what a wonderful way to repurpose the sweater. I love it as a bag. A fantastic re-purpose. It turned out great! I LOVE this!! And it looks fantastic!! You did a great job. What a great idea. That is so cute.